Recently our company held a huge promotion called the RentPayment Sweepstakes that awarded a $10,000 Grand Prize. Instead of doing our traditional advertising for promotions (like shipping printed materials to participating properties), we did very little advertising and experimented with using social media and viral marketing to let renters spread the word about the promotion to each other. The results was surprisingly successful and we gathered a lot of interesting data on which social media channels renters out there are using the most, plus which channels they use to share news and information. In addition, we also determined which channels were most valuable by determining which actually generated the most traffic to our website. I’d like to share these stats with you! In the 5 month promotional period, the sweepstakes had close to 1,000,000 entries from over 300,000 eligible renters! All of this traffic, without using our traditional marketing/advertising methods. How? We let the renters speak for us! Residents were able to “share” the Sweepstakes through Email, Facebook, Twitter, and MySpace with neighbors, roommates and friends. 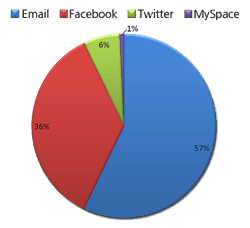 The chart below shows the percentage of shares (emails, messages, status updates or tweets) that were sent among these various channels. The highest percentage of shares were via email – about 2,000 emails! This shows how powerful email is as a marketing tool for communication with renters. As expected, I’d like to also point out that Facebook is the most popular of the social networking sites among our renters for sharing information. We also looked at the ability of these four channels to actually draw traffic our site. (Shown in the chart below). These results show that as a communication tool email had the greatest call-to-action, accounting for 98% of the total website traffic from all sources combined. 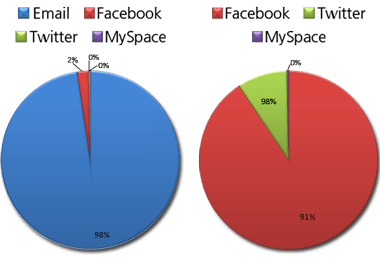 Out of the three social networking sites, Facebook generated 91% of the total traffic and Twitter generated the other 9% showing that Facebook sharing was the most valuable traffic source, but MySpace sharing has next to no value. All in all, one fact our team learned from this is that Facebook is the most used and the most valuable of all the Social Networking sites (at least amongst our renters). Also, Email is an extremely valuable tool for the Multifamily industry – but one we see as very underused! A lot of Property Managers we work with still do not collect email addresses, which shocks me. Do you collect email addresses at your property? Our advice is for Property Managers to take advantage of email as a communication channel for prospecting, operational efficiencies and to distribute promotional offers to build renter satisfaction. Elizabeth Moothart is a Marketing Coordinator for RentPayment.com. Specializing in social media and promotional programs for RentPayment, she leads the way on increasing awareness of RentPayment products. For more information on RentPayment and Marketing ideas check out: http://blog.rentpayment.com.